A worthy heir to a tradition where elegance takes the leading role, the Longines DolceVita collection has met with widespread global success since its inception. Inspired by the Italian sweet life, the “Dolce Vita”, it is worn on the wrists of women who know how to make the most of life’s simple pleasures. As a tribute to those women, Longines has decided to offer a new interpretation of this collection, subtly combining geometric lines with soft curves. 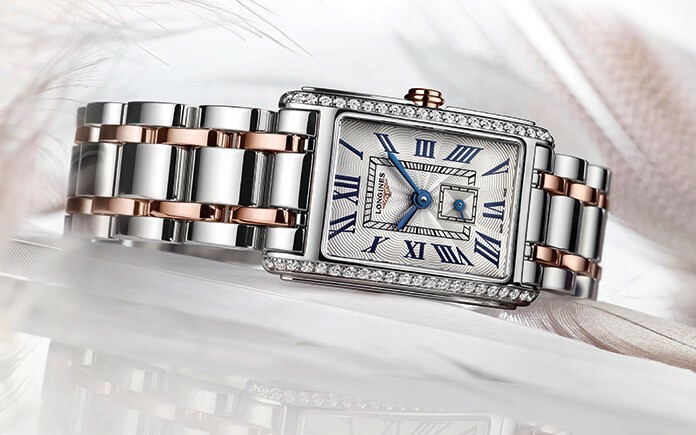 The lines of the rectangular case have thus been elongated and arched, some models enhanced with diamonds, to magnify the contemporary elegance and femininity of these new pieces. These new decidedly feminine and charming designs will not fail to delight women who boast a joyful, carefree attitude and love to wear adornment that reflects their style for a happy and colourful picnic at the racetrack. Cased in steel, and sometimes decorated with diamonds, the Longines DolceVita collection comes in four dimensions. A silver-coloured “flinqué” dial adorned with painted Roman numerals and a black lacquered or white mother-of-pearl dial with diamonds decorates the watches of this line. Slender rhodium-plated or blued-steel hands point to the passing hours and minutes. With their quartz movement, the timepieces are finished by a choice of black, white, grey or red leather straps or by a stainless steel bracelet.